My current electric kettle went psycho on me a few months back. The kettle doesn’t stop boiling and I almost had a heart attack when I saw water spitting out from the sprout non-stop. After that, I was very caution when I need to boil water. I’ll stand next to the kettle and wait for it to boil. It doesn’t cut off by itself so I’ll need to do it manually. It was quite irritating / dangerous. During my recent trip to Melbourne (Australia), I decided to browse the options of electric kettle there…(it was not intentional as I was there with my bro to hunt for a TV). I couldn’t resist it from the first moment I saw it sitting on the display shelf in Harvey Norman. It was almost love in first sight. But, I hesitated because of the hefty price tag at AUD 98 (sigh… I can’t justify to myself forking out RM 300+ for a kettle). When my brother saw me salivating over the kettle, he told me that he saw a rather similar kettle in Big W (different model same brand) for a lower price. Really?!! Hooray!!! We quickly scramble off to Big W to hunt for the kettle. I was so excited when I see it priced at AUD 68 (about RM200+). Yes – my bro got his TV too. LOL. 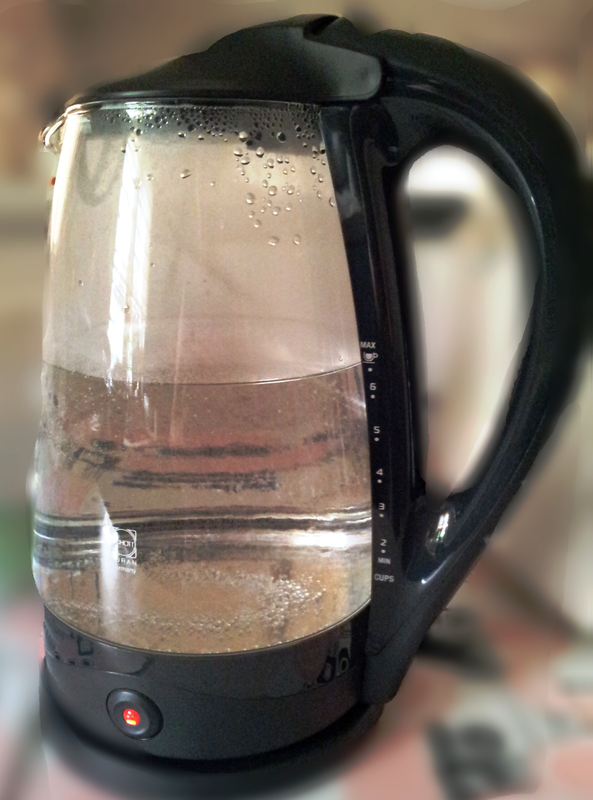 Let me introduce my newest toy in the kitchen – the Breville’s Glass kettle. Yes – the body of the kettle is made from glass. How COOL is that? Note that it is not just any normal glass. It’s Schott DURAN glass !!! I am a big fan of Schott glass product (love their range of Schott Zwiesel Tritan Crystal Glass!!! – I’ll reserve that for another blog post one day). Schott has more than 125 years experience specialising in glass. DURAN is the division for the lab devices. So, I was pretty confident the glass should be quite durable (unless you drop it) and able to withstand boiling heat with no effect on the material property. For more information on this glass kettle, you can find it on Breville’s website (http://www.breville.com.au/glass-kettle.html). Breville is an Australian owned company specialising in Kitchen Appliances. Same thing happened to our kettle too. Love the glass one, but I too won’t fork out RM300+ for it. We’ve always been buying stainless steel ones so far. lol.. yeah, the glass one was abit of a spoilt-myself pressie… Bad chulet baaadd. Good luck buying a new one.